Today I want to look at setting up caloric deficits for fat loss. So we’re clear, I’m going to start from the assumption that you must create some form of deficit (e.g. an imbalance between your intake and expenditure) for fat or weight loss to occur. I know that there are a lot of arguments that this is not the case but simply, decades of research says that it is. I’m also going to assume, and realize that this is more for simplicity than anything else that whether you create the deficit via diet or activity, the end result is basically the same. Note that this is absolutely not a correct assumption. But to save space and keep things less confusing, I’m going to work from that basic assumption; at some later date I’ll address that particular issue in more detail. What I want to look at is the various pros and cons of using small, moderate and large caloric deficits when setting up a fat loss diet. As is usually the case you can find people arguing adamantly that only one or the other is appropriate; as usual I take a little bit different view: each approach can be relatively more or less appropriate for a given situation. Note, I’m not saying that these definitions are the exactly right ones, they are simply how I define the terms. As I examine each, simply for the sake of putting some real world numbers to what I’m talking about, I’m going to use two sample dieters. The first is a relatively ‘average’ female who weighs 130 lbs and has a maintenance caloric expenditure of 1950 calories per day (15 cal/lb or 33 cal/kg, let’s just call it 2000). Our male weighs 180 lbs with a maintenance caloric expenditure of 2700 calories/day. I’ve discussed why and how I came up with the value of 15 cal/lb in the article How to Estimate Maintenance Calories. Finally, I’m going to estimate weekly fat loss for each of the deficits as I go through. I’ll use the standard estimate of a 3500 calorie deficit equaling one pound of fat loss. I’ll only note that real-world fat loss will never actually achieve the estimated value, it’s always a little bit lower. I’ll explain why this is the case in a future article, for now simply accept that that’s the way things work. It’s not unheard of to hear of athletes or bodybuilders using very small caloric deficits to generate fat loss with a 10-15% deficit below maintenance being used. As well, some diet experts tend to recommend small deficits for even the general dieting public. Before looking at the pros and cons, let’s look at how this deficit will end up impacting on caloric intake as well as estimated weekly fat loss. Notice that the male, by simple dint of having a larger maintenance requirement will end up with a larger caloric deficit than the female and a larger predicted fat loss. This was actually one of the reasons that I argue for using percentage based deficits in my first book The Ketogenic Diet, they take into account the individual needs of the diet. That’s compared to either giving people absolute caloric recommendations or telling people to reduce their calories by some fixed amount. First, some of the pros of this approach. Clearly the deficit is fairly small and can be achieved relatively easily. A small food restriction will usually accomplish it and often times, the deficit can be achieved by making simple qualitative changes in the diet (e.g. replacing 2% milk with fat free milk may save 40 calories and across three meals that’s 120 calories). Even if absolute food intake has to be restricted, the difference is relatively small compared to normal eating patterns. For some people, this is beneficial behaviorally since they tend to do better with small non-intrusive changes. It’s also often argued that this type of tiny deficit will have less of an impact on some of the counter-regulatory responses, the metabolic slowdown and such that can occur. There is arguably some truth to this although the compromise for this is much slower fat loss (discussed next). Finally, related to the fact that the adjustments are often small, it is often argued that long-term adherence may be better than more extreme diets; since there is less overall restriction involved in the first place, the odds of the person slipping or losing control is lower. Again, there is some truth to this. Finally, for performance type athletes, since there is never much extreme dietary restriction, the odds of hurting training or performance are lowered. Big deficits can destroy training or at least require that it be modified to avoid the person crashing hard. Small deficits generally avoid that. But what about the cons? The biggest issue with this approach is that the fat loss is so exceedingly slow. Typically when I have seen people use this approach it is with folks who are relatively lean and don’t have much fat to lose in the first place. A contest dieter (bodybuilder or figure person) who is starting close to their goal may only need to drop 10 pounds of fat to get into shape. Of course, for our female, that still may require 20 weeks of straight dieting. But for some people, and this is usually with folks who really know their bodies, this may work better. For larger individuals, even with the relatively faster rates of fat loss, the slow rate of loss may be discouraging and frustrating. As I discussed in another context in The Full Diet Break, individuals who have 50-100 or more pounds to lose often have a great deal of psychological struggle to overcome; losing a mere 1-2 pounds per week can make the diet take forever and that can lead to failure. The final con with this approach is this: it’s real easy to screw up. The small deficit makes it possible for even tiny mis-measurement of true food intake to obliterate the deficit. I discussed this idea in a different context in the Q&A on Not Losing Fat in a 20% Deficit but it is potential problem. Again, in my experience the people who make this approach work are absolutely meticulous with their diet, they measure everything to the gram. Otherwise, it’s altogether too easy for what you though was a 300 cal/day deficit to be nothing but a 100 cal/day deficit. For the most part, I think the small deficit approach is best for the type of dieter I’ve described a couple times above: advanced dieters and/or athletes with relatively less fat to lose who are obsessively meticulous with their calories. For others, a moderate or large deficit will probably be a better choice. Next let’s look at moderate deficit dieting which is probably the most commonly advocated approach especially in the bodybuilding and athletic subculture. As noted, I’ll be defining this as anywhere between 20-25% below maintenance calories. Again, let’s look at what this makes the deficit and what the estimated weekly fat loss will be for our two sample dieters. Now we’re getting into more standard fat loss diets with recommendations of 1-1.5 pounds fat loss per week being a common recommendation. Of course, the drawback is that a larger deficit must be created to get that level of fat loss. Generally speaking moderate deficit diets tend to use a combination of food restriction and activity to accomplish the full deficit; I know I said I wouldn’t really talk about this in this article but it’s worth mentioning. 250-300 calories/day of activity with a 250-300 calorie/day food restriction is still pretty manageable and requires neither massive amounts of exercise or massive amounts of food restriction. It is entirely possible to do the full deficit through food restriction of course. This tends to allow much of the food flexibility and such that small deficit diets have as one of their pros; the diet only has to be changed minimally to achieve the necessary deficit. Even there, moderate deficit dieting does feel like more of a diet than small deficit dieting, the individual will feel more restricted overall (unless they create the entire deficit through activity). For athletes and performance types, this is a benefit since it tends to have a small impact on gym or sports training. This is especially true if concepts such as the refeeds and full diet breaks discussed on the site and in my A Guide to Flexible Dieting are adhered to. Of course, since the fat loss is faster, the diet tends to get finished quicker. While some larger individuals with a lot of weight to lose may still find the prospect of dieting for a year to be overwhelming, at least things will be happening a lot more quickly than with small deficits. In terms of screwing up, it certainly is possible to offset some of the deficit of a moderate fat loss diet with mis-measurement but it’s far harder to eliminate the deficit completely. It can be done, make no mistake about it, but its relatively more difficult (what usually happens is that an expected 500 cal/day deficit ends up around 250-300 cal/day and people wonder why the fat loss is only half what it should be). Metabolically, moderate deficit dieting does have an impact for reasons I’ve discussed endlessly on the site and in my books and won’t discuss again here. But between the rate of fat loss and impact of caloric restriction on hormones like leptin, etc. there’s no getting around the fact that the body will fight back to some degree with moderate deficit dieting (realistically: this will happen on any diet no matter what you do). Frankly, outside of the fact that moderate deficit dieting may take really extended periods for very overfat individuals, I’d probably say it has the fewest overall cons relative to the potential pros. Which is probably why it tends to be one of the most widely recommended and used approaches. Of course, some people are still impatient and/or or have their own reasons for wanting or needing faster fat loss and the moderate fat loss of the moderate deficit can be both a pro and a con in that regard; it’s faster than small deficit dieting but under certain conditions may not be fast enough. And that brings us to large deficit dieting. While I’m going to define large deficit dieting as anything greater than 25% below maintenance, for the sake of this discussion, I’m actually going ot use a massive deficit: a full 50% below maintenance. Just to illustrate the point. I actually advocated this size deficit in the first phase of my Ultimate Diet 2.0 but it’s also only for 4 days. 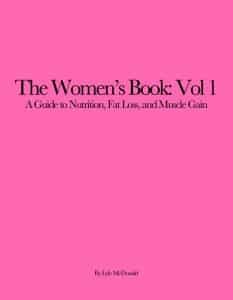 The Rapid Fat Loss Handbook actually revolves around protein intake rather than caloric intake per se but,on average, the deficit may end up at 50% below maintenance or even more. So that’s why I’m going to use 50% for this illustration. I’d note that for very large individuals, with high maintenance caloric expenditures, greater rates of fat loss are possible with one-half to two-thirds of fat loss per day being possible when calories are low enough. Now, clearly the biggest pro (to some) of this approach is that the rate of fat loss is maximal. Even our smaller woman is losing a significant amount of fat per week and the male is dropping fat at a pretty absurd rate. As noted, for bigger people, the numbers go up further and fat losses of 4-5 pounds per week are not unheard of. Of course, a pro of that is the diet ends much more quickly than it otherwise would. A diet that might have taken 2-3 months may be compressed into a month. For some people, this is a huge pro, they can get back to serious training or what have you since the diet isn’t interrupting things for extended periods. As well, in some situations (e.g. class reunion, wedding 2 weeks away), people may only have a limited time to lose the maximum weight/fat possible; that requires an extreme approach because there simply isn’t time to use anything slower. As well, for people with a large amount of weight to lose, seeing a quick initial drop can provide some nice positive reinforcement to continue with the diet. Again, someone with 50-100 pounds to lose will likely be disappointed to drop only a pound or two in the first week. A large deficit diet may generate a scale drop (and some of this is water weight) of 7-10 pounds in the first week. This can help with long-term adherence. Even a 2-4 week period with a large deficit to get some quick initial weight/fat loss before moving into a more moderate deficit approach can be beneficial here. And, assuming the diet is set up appropriately (adequate protein) with the right kind of training (heavy weight training as discussed in Weight Training for Fat Loss, muscle loss actually turns out to be minimal or zero. I know this runs counter to the commonly held belief but it’s 100% true (as people following my The Rapid Fat Loss Handbook properly have demonstrated). Certainly early research suggested that bigger deficits and very low caloric intakes led to more muscle loss but invariably they had inadequate protein and didn’t have weight training as part of the program. When someone is on 300 cal/day and half of that is carbs, well, that’s only 40 grams of protein. Of course muscle is lost, but not because calories are low per se; rather it’s because the diet is set up stupidly. Which brings us to one of the cons: because of the massive deficit involved, most of it almost has to come from diet. Most can’t spend the hours per day to expend the types of calories inherent to large deficit dieting so it comes down mostly to diet. And since so few calories are being consumed, this allows for very little food flexibility. My large deficit diets always end up being high-protein, low-carb and relatively low fat because that’s the only way to achieve the necessary deficits while providing sufficient protein. There simply isn’t room for much else. From a long-term adherence standpoint, that can be a problem. Of course, my diets also always include free meals, refeeds and diet breaks to account for that but some can go crazy with such a limited number of foods available. Then again, large deficit diets are rarely meant to be used in the long-term in the first place and often the short-period of extreme restriction seems to ‘reset’ some food issues for people. They can lose their taste for a lot of the stuff that they used to over-eat previously and that can help in the long-term. Which brings us to the issue of adherence. Again, contrary to popular belief, as I discussed in Is Rapid Fat Loss Right For You? there is actually some data suggesting better long-term weight loss with faster initial weight/fat loss. But this is predicated on the diet being set up in certain specific ways: the diet must change long-term food patterns (meaning it should revolve around whole foods, not protein shakes), it must include exercise, it must work on behavioral aspects of eating. Not all large deficit diets are set up that way and the ones that aren’t are destined to fail. Diets based around living on shakes or what have you may generate amazing fat loss but they do nothing to help in the long-term, nothing has been changed about long-term eating habits to help the person know what to eat when the diet ends. Of course, with a deficit that massive, it’s nearly impossible to completely offset the deficit without some pretty major screw ups in terms of food choices. Make no mistake, it can happen, people end up choosing high-protein foods that contain too many tagalong fats and carbs and this offsets the deficit. But even with that, the deficit ends up being pretty damn big and fat loss is pretty quick. On that note, the severe restriction can be too much for people although, interestingly, many report that hunger actually isn’t a huge issue. Between the hunger blunting effect of massive amounts of protein and other issues, hunger often goes away. Odd but true and this certainly isn’t universal. As well, long-term adherence can be an issue and returning to maintenance caloric intakes is a problem for some. This is actually a big part of why large deficit diets are best set up around whole foods. When the diet is based around protein shakes, the dieter has no idea how to ‘eat normally’ when the diet is over. When the core of the diet is based around whole foods (e.g. lean protein, veggies, essential fats), the dieter simply adds other foods back to that core when the diet ends (or they choose to move to a more moderate deficit). Even there, some people simply can’t make large deficit diets work, they end up yo-yoing back and forth and should consider something else. Of course, metabolically, large deficit dieting can have the biggest impact on metabolic parameters. But that’s the price to pay for faster rates of fat loss. As I’m fond of saying, life she is full of these little compromises. If you want to have a minimal impact on metabolic rate and such, use a smaller deficit; the price is simply slower fat loss and a longer diet. Of course, properly scheduled refeeds and full diet breaks help to offset much of this so large deficit diets can still be made workable if you do it right. Again, they still aren’t for everyone. Finally, large deficit diets have the greatest impact on training and ability to train. It actually turns out that too much activity with a large caloric deficit can cause more problems than it solves and, generally, training has to be massively curtailed during the diet. For people who simply love training, or must train a lot for whatever reason, large deficit diets are unworkable. They must do something else. Then again, for some athletes, a 2 week block on a large deficit (with training severely cut back) can be used to let them get back to training and may have less of an impact on training than having to diet moderately for 10 straight week. This simply depends on the specifics. So that’s that, a look at three different approaches to setting up the caloric deficit for dieting and their pros and cons. Clearly none of the three is inherently the best approach although, on the whole, moderate deficit dieting probably has the most pros with the least cons. Even there, there are times when either a very small or large deficit diet may be appropriate. Hopefully the above will help you decide which is right for you.